Vitamin A deficiency diseases show which functions of the human body are disturbed at high degree deficiency of vitamin A. Vitamin A deficiency among children in developing nations ist he leading preventable cause of blindness. The earliest evidence of vitamin A deficiency is impaired dark adaptation or night blindness. Moderate vitamin A deficiency may result in changes in the conjunctiva, especially in the corners of the eye. 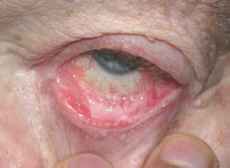 Severe or prolonged vitamin A deficiency causes a condition called xerophthalmia or dry eyes. This is characterized by changes in the cells of the cornea that ultimately result in corneal ulcers and blindness. CLINICAL PRESENTATION In ocular cicatricial pemphigoid the conjunctival bullae are evanescent and therefore are seldom visualized. The initial symptoms usually include irritation and tearing due to ruptured conjunctival bullae. Subepithelial scarring with gradual obliteration of tear gland openings and loss of mucous glands ultimately results in keratoconjunctivitis sicca. In addition, surfaces on the bulbar and palpebral conunctiva fuse together, resulting in symblepharon. Eventually these symblephara obliterate the conjunctival fornices impairing lid closure. A band of symblepharon extending across the medial part of the lower cu-de-sac is typical of early ocular pemphigoid. The resulting entropion, tear deficiency, and lagophthalmos conspire to cause corneal opacification and loss of vision. Although a few unilateral cases have been seen, cicatricial pemphigoid almost always eventually becomes bilateral. However, involvement of the second eye may be delayed for up to two years.